“ This documentary is dedicated to everyone who wants to fight for truth and life on planet Earth. Weather manipulation is only one (collateral) aspect of this phenomenon. What is at stake is a covert military agenda. This HD documentary film is the first Italian professional film on illegal geo-engineering aka chemtrails. It has been realized thanks to many friends and collaborators. 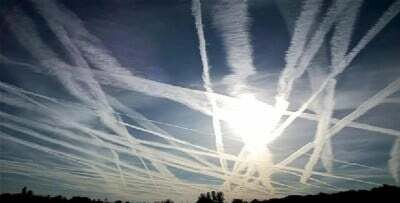 For years this issue has been denied and mocked but the chemical spraying of our sky is still going on ! In September 2014, Jacques Daidié, a French activist, went to Italy and met Antonio and Rosario Marciano, well-known Italian activists against geo-engineering. The French translation is born from this meeting and has been realized by several members of the French association “Ciel voilé”, (www.cielvoile.fr). We thank him warmly and all those who have contributed to the translation: Jacques, Dominique from Avignon, Mary from Monteux, Sebastien from St Firmin in Valgaudemard and Danielle from Gap.